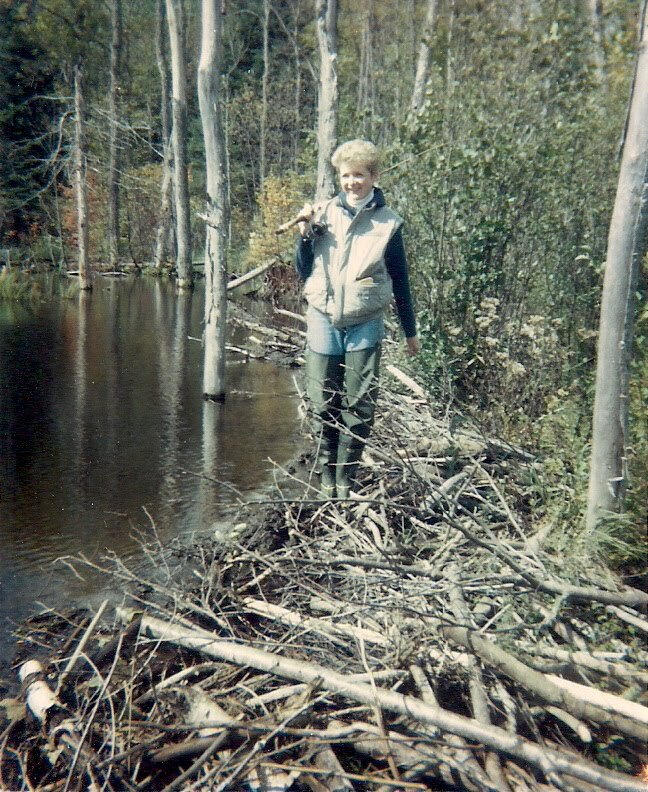 I'm at home in New Brunswick this week, visiting my mum. This means drinking lots of tea, watching all of Downton Abbey Season 4, and maybe squeezing in a couple of days of power shopping. My mum is 86 and still lives on the farm although she moved into a much smaller house two years ago, the old farmhouse having become too much to manage. The little house is still on the farm property, so it's close to her neighbours and friends who have become so much more important in her life since my step father died a few years ago. Mum has no interest in moving to Ontario to be close to my sister and me, or to Alberta where my other sister lives. She has her own life, she says. Sometimes it's lonely, understandably, but on those days she puts on her Jim Reeves CD, cranks up the volume and does a few minutes on her treadmill. I'm smiling as I write that last bit. And hoping I've inherited some of those 'never quit' genes! I love the old farm. I love old stuff in general: antiques, vintage hats and jewellery, and especially old photographs. Old photos make me want to crawl inside them and walk around...soaking up the past. I've been looking at some old photos of my mum's this week. I have a passion for vintage fashion. And as I look at these old photos I marvel at the fashions my mum and her sisters wore in the 40's and how current they look. Especially this season. 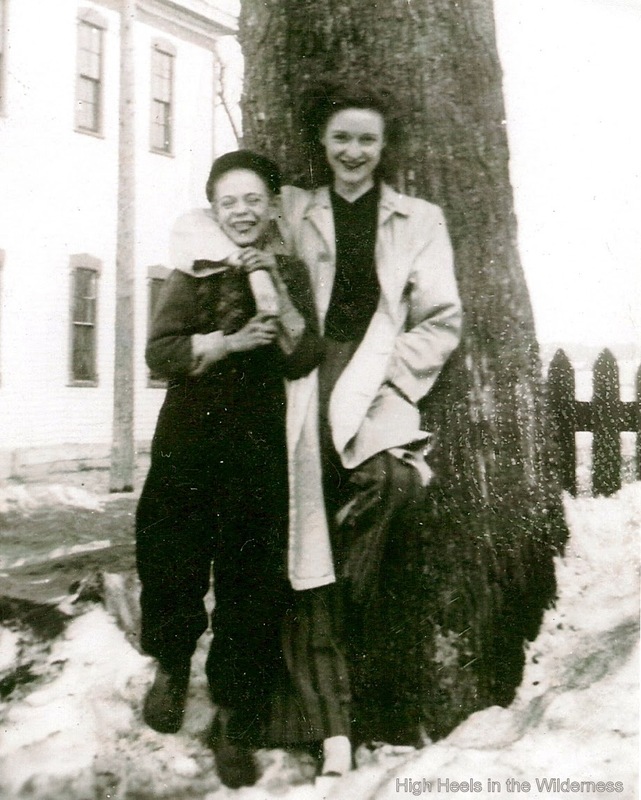 This is a picture of my aunt Marion and a friend. 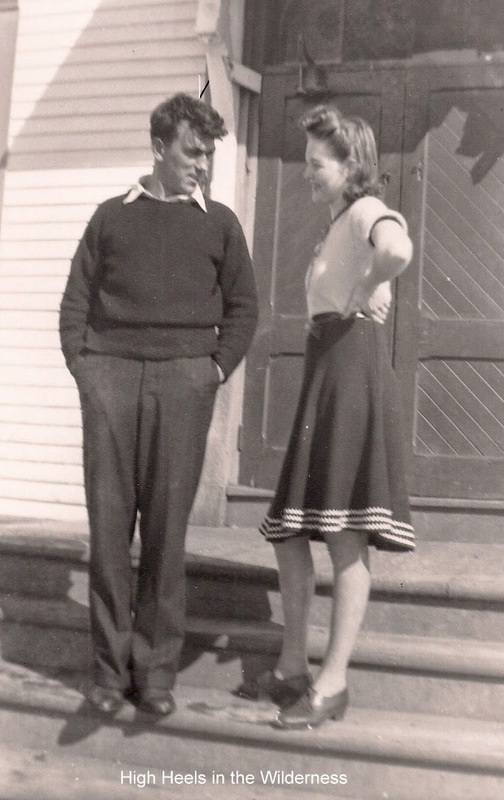 It's outside my grandparents' house in Fredericton in the 1940's. That's my Aunt Marion on the right. Mum says that Marion was "always a lady." Sweet tempered and gracious. She died very young, a few days short of her 21st birthday. She died of an infection, penicillin not being available then. Sad, isn't it? My grandmother always, always called me Marion by mistake. She said with my curly hair and round face, I reminded her of Marion. I love the coat she's wearing in this picture. Marion is wearing the same coat in the shot below. Love, love that oversize clutch too. 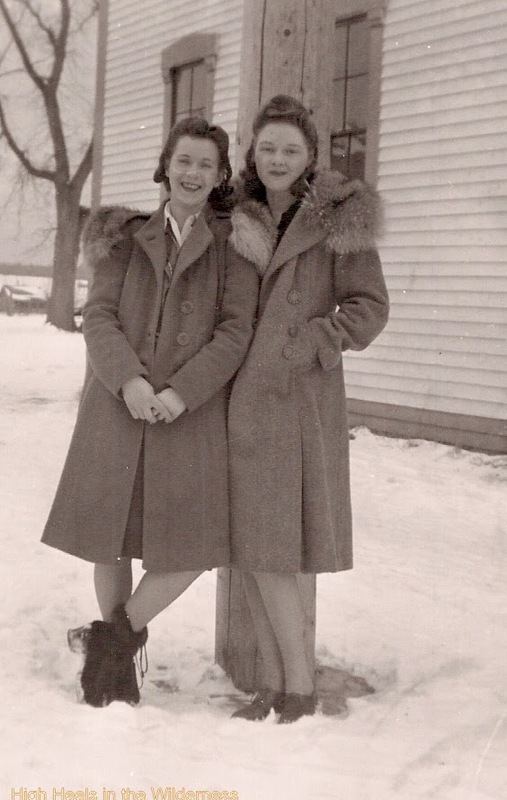 That's my mother's other sister, Gwyneth, on the right, in the trench coat and the head scarf. Don't they look the very picture of glamorous insouciance? I love how Gwyneth is looking straight at the camera, as if to say "Go ahead; take my picture... that lens does not intimidate me!" This is a picture of Marion and a friend. It's taken on the steps of the schoolhouse across the street from my grandparents' house. If I could somehow magic that skirt out of the picture, I'd pair it with a white shirt and my jean jacket. And look great. She had great legs, Marion did. All the Sullivan women had great legs. 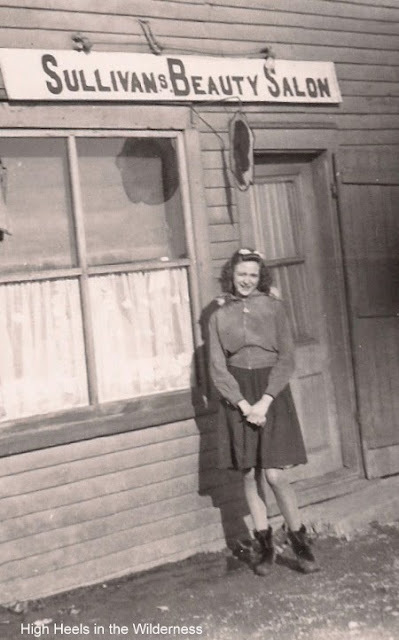 Even when she was in her 80's my grandmother Sullivan had pretty ankles. And speaking of great legs. This is my mum below; I think she's about 15. Kate Moss eat your heart out! Mum is standing outside her sister Marion's beauty parlour. Marion had just qualified as a hairdresser and opened her own shop when she became ill. Look at Mum sporting those ankle boots! And that blouson jacket. This is my mum and her younger brother, my uncle Allie. It's a couple of years later than the one above. I have always loved this picture. My mum looking so grown up, but not too grown up to put a head lock on her favourite little brother. I love how he's grinning and sticking out his tongue. 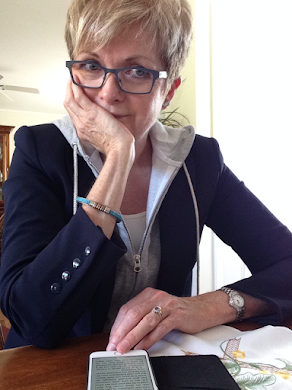 Here's mum, below, in the same outfit, looking pensive and gorgeous. She could walk right out of that shot and onto the catwalk. I love the dark lipstick and nail polish. And that loose, open trench coat with the blouse buttoned up to the top and the full pants... very, well... Katharine Hepburn, if you ask me. See what I mean? 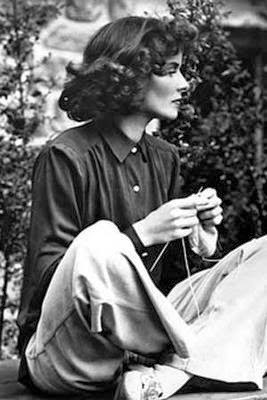 This is a shot of Katharine Hepburn, on a movie set in the late 30's, waiting for her scene, knitting. And the look...the look is the same. I know my mum misses the days when she could "be stylish," as she puts it. Although she doesn't wear high heels anymore...or skirts...she does have a lovely little jacket that she wore to my niece's wedding last Christmas. She looked pretty fine, I must say. Still stylin' in her own way. Because, you know, whatever age we are...over 50 like me, or over 80 like my mum...we never lose the love for that perfect outfit that makes us feel like a million bucks. It's a love that never grows old. This week Mum and I will be indulging our shared love of clothes and all things vintage with our Downton Marathon. Edith looks particularly lovely in Season 4, don't you think? Thank goodness it's on CD. That way we can 'pause' to admire a particular hat, or dress. Or to put the kettle on for tea. Are you a lover of vintage fashion? Thanks Katherine for hosting the Blog Hop. It's such a great opportunity to share and to see what others are doing. Love it. I absolutely love this! 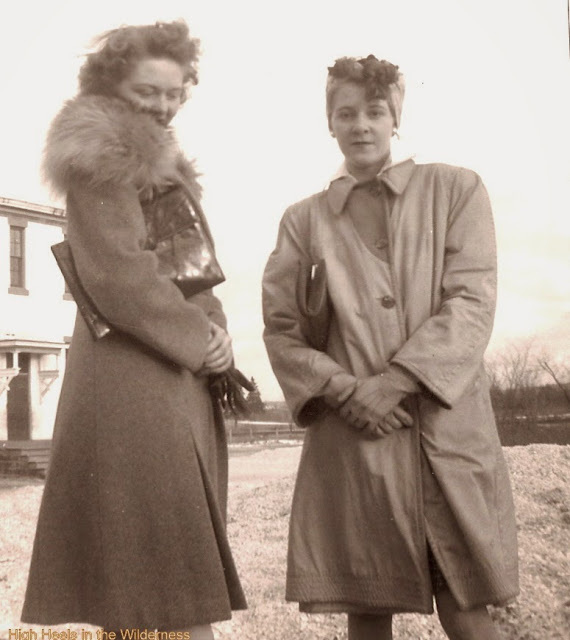 Vintage fashion is the best - your photos are so charming! Thanks Beth. Old photos are great, aren't they? Your mum might like my blog! I love this picture of Katherine Hepburn...and thanks for sharing on the Thursday blog hop! Thanks Pam. I will give my mum your link. She is learning to do new things all the time on her lap top. Pretty great for an 86 yr old! I loved looking at your stylish family! Great post! Thanks very much. My mum will be tickled pink when I show her your comment! Dropping by from Katherine's Corner during the blog hop. Your mom is quite the dish! My mom is 85 and also still going strong...gotta love those genes. Thank you for sharing these amazing photos of your mom and her siblings. Thanks, Sue. I hope that I inherited those genes. Hi Susan! You captured me at once with your line about crawling inside old photos and walking around a bit - soaking up the past. Sounds like something I'd say. 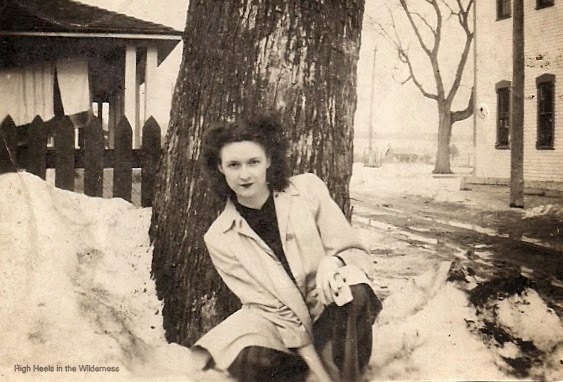 And, yes - I love the old photos of my mom, too. She's gone now, these past ten years. So blessed you are to have your mum. Aunt Marion was a delight to meet - that collar!! So tragic her life was cut so short. I'm a 1940's fashion fan, too. I prefer old movies and most often am staring at every inch of costuming. I've filled my own closets with remnants of the day - some wearable! Oh - do plan to re-post this at my linky this month. Just started it - All Things Bright and Beautiful at The Writer's Reverie - Monday, April 28 - check out the details on the page tab under my header. To be sure, you have posted about one of my favorite things this week at Katherine's Corner. Thanks so much Kathy. I'm the same way about old movies...I am so focussed on the costumes I have to watch a second time for the plot! And I will definitely check out your blog anf the link-up! Hi Susan - Once again a great read and I'm so blessed that you shared it at All Things Bright and Beautiful this month! Definitely worthy of an "encore performance" - introducing these lovely ladies to new readers! Hope you'll make plans for the end of May, too - see you soon! You will definitely see me/my blog in May! Thanks Kathy. Enjoyed this post a lot. I love looking at old pictures and hearing the stories. Great party that Kathaleen has hosted. Thanks Cindy. Great party, indeed! Thanks for the kind comment, Diane. I have been passing all the comments on to my mum ... she finds it hard to believe that we all love her pictures and think she looked gorgeous. You're watching season 2, eh? Enjoy! I have a hankering to go back and watch all the Downton episodes from season 1! I love these photos! I am a lover of vintage fashion too. I would love for the styles of the fifties and early sixties to be completely the rage. I would love to be able to walk around in a hat and gloves and a wonderful, open coat that pulled it all together over my tailored dress. Of course, with my body, I couldn't pull it off that the beautiful women in your family. This was a great post. I found it at All Things Bright and Beautiful. Thanks Debbie. I know what you mean. Every year at the vintage clothing sale here in Ottawa, I drool over the elbow length gloves... and the hats...I own so many hats that I never wear! Wish someone I know would throw a party that requires wearing a hat...and gloves!